Many workplaces contain spaces considered “confined” because their design hinders the activities of employees who must enter, work in, and exit them. The definition of a confined space is one that has limited or restricted means for entry or exit, and it is not designed for continuous employee occupancy. Examples of confined spaces include underground vaults, tanks, storage bins, manholes, pits, silos, process vessels, and pipelines. • Contains any other recognized safety or health hazard such as unguarded machinery, exposed live wires, or heat stress. Nationwide there are a combined 6 million workplaces with confined spaces which is why having safety manuals covering it is very important. 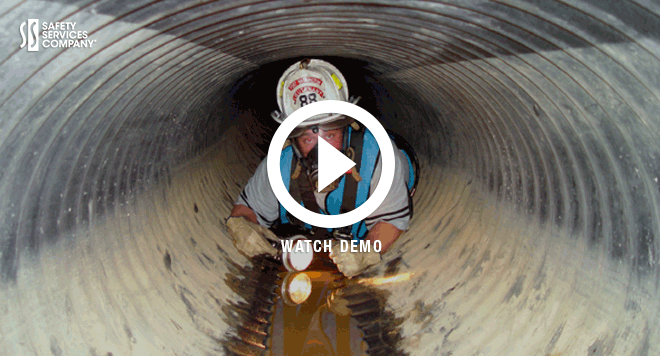 In 2013, 195 workers died and another 11,000 were injured in confined spaces. To limit these incidents of injury and death OSHA has instituted regulations (29 CFR1910.146) dealing with confined spaces. The regulation requirements include identifying hazards in confined spaces, defining your workplace-confined spaces, and setting up a permit policy. OSHA notes, by their very nature and configuration, many permit required spaces contain atmospheres that can be immediately dangerous to life and health (IDLH)”. For example, many confined spaces are poorly ventilated – a condition that creates an oxygen-deficient atmosphere and allows the accumulation of toxic gases. • If it is a permit-required confined space. If you determine your employees will enter permit-required confined spaces, then you must have a written confined space entry program and training plan. If your confined spaces don’t require permits, or employees will not be allowed access, you must develop a training program that teaches what constitutes a confined space, the hazards that may be encountered inside them, and the precautions that must be taken by confined space entrants, attendants, and supervisors to prevent accidents and injuries. Complying with the OSHA Confined Spaces requirements can be challenging, requiring you to either to develop a training program yourself or to outsource with expensive safety consultants. Here at Safety Services we have developed a “Do-It-Yourself” training program that is both simple to administer and fulfills all your OSHA safety training requirements. Our Confined Spaces training kit consists of a simple three-step solution that brings all your employees into compliance. o A computer based training program that allows employees to navigate an electronic training program at their own pace, and then take an automatically graded test. o Instructor presentations and printable student material that can be used for group classroom instruction, or when computer access is limited. 2. Field training – The second step of training is in the field. During this part of the training, your appointed trainer shows the trainees how to apply the materials they learned in the classroom session. This innovative Confined Spaces training kit features an Interactive Training Program, Student’s Handbook, Instructor’s Handbook, OSHA Regulations, Student Tests, Training Logs, Fall Protection Checklist, Certificates, Wallet Cards and More. The training provided by our Confined Spaces program meets OSHA requirements for entry supervisors, attendants, and entrants. Note: Employees who will be responsible for conducting or directing rescue operations will require specialized training not included in the program. If you have a question about safety meeting topics or are ready to order your Confined Spaces training kit, contact us today at 888-461-5023.